Frigg returns to Lakeside having dazzled the audience on their debut. This Nordic band has thrilled Celtic Connections, The Scots Fiddle Festival, Fiddles On Fire, Cambridge Folk Festival, Orkney Folk Festival and many more. Their fiddle-founded Nordgrass sound - a mix of Nordic folk and American bluegrass - is exciting, uplifting, and inventive. 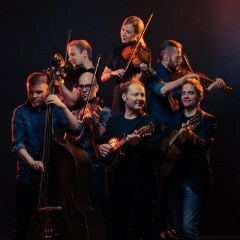 This swirling blizzard of jigs, reels, polskas and bluegrass inventions from seven of Finland’s finest musicians is not to be missed.